money” to open the Food Pantry. The original Food Pantry was in the old Valena C. Jones School building at Old Spanish Trail and Bookter Street in Bay St. Louis. The director of Civil Defense, Bobby Boudin, was using space in the school, and found space in the gym for the Food Pantry to open on May 19, 1986. In the first few months of operation (May 19 through the end of July, 1986), the Food Pantry provided food to 49 families and spent $492.97 to buy food to supplement that donated by area churches. The first refrigerator/freezer was donated in late June or early July of 1986 by way of a request in "Quotables by Cuevas" which ran in the Sea Coast Echo June 22, 1986. When Bobby Boudin and Civil Defense moved to the old jail in the County Courthouse on Main Street in Bay St. Louis in May, 1987, the Food Pantry also relocated to the "hang mans room" in the old jail. Later when Civil Defense moved to the McDonald Building adjacent to the Mississippi Power Building on Hwy. 90, the Food Pantry also moved and operated from the rear portion of that building. Hurricane Katrina destroyed the McDonald Building on August 29, 2005. The Pantry resumed operation on February 1, 2006, in a temporary facility owned by the Hope Haven Center for Abused Children at 716 Herlihy Street in Waveland, MS. In February 2007, the Hancock County Board of Supervisors designated a piece of county-owned property on Highway 603 for the construction of a new building for the Pantry. The Bucks-Mont Katrina Relief Project, based in Pennsylvania, raised over $300,000 and constructed a new building for the Pantry on this site. 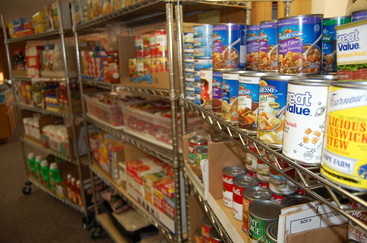 The Food Pantry began operations in this new facility on February 2, 2009.